"If you appreciate simplicity and eco-friendly travel, do yourself a favor and get yourself to La Hacienda in Las Galeras for an authentic Dominican experience in a beautiful, natural setting." La Hacienda Hostel provides budget accommodations in Las Galeras on the Samana Peninsula in the Dominican Republic. La Hacienda Hostel is a 10 minute walk to the nearest beach, overlooks the bay in Las Galeras and is the starting point for the hiking/horseback riding trails in Cabo Samana National Park. La Hacienda Hostel has rooms with private bathrooms starting at 28 USD, dorm beds (14 USD), and tents (12 USD). Ideal for large groups on a budget. New holiday home available in 2016. Las Galeras is the type of place travelers crave but rarely find. It is a sensual feast of nature and typical Dominican life. Karin is a lifetime horsewoman and a trek through the countryside to hidden beaches and caves is a perfect way to learn about the wonderful natural environment of Las Galeras. Don’t miss what many describe as the highlight of their visit to the Dominican Republic. 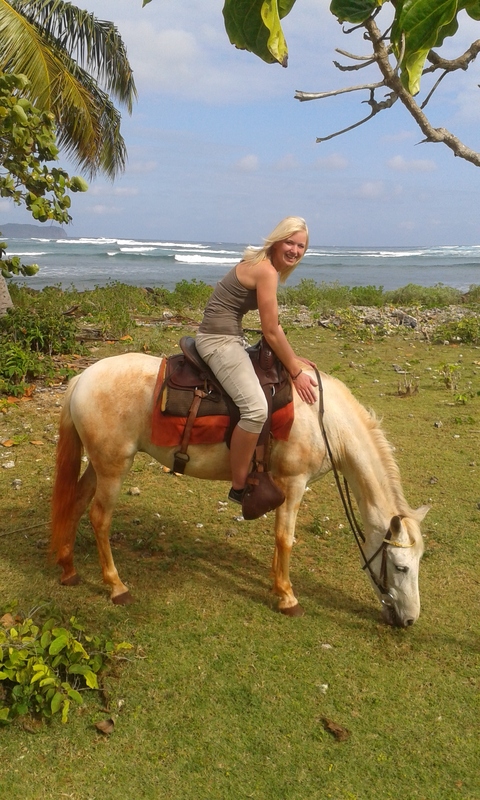 Karin can provide horse and accommodation packages for your group.